Congratulations to our winner: Melody H. of Union, Missouri! Thanks to everyone who entered – we’ll launch another sweepstakes soon! Planning for a getaway can be loads of fun. The anticipation just adds to the excitement. Because memories can last forever. We posted this recently on our Santa Claus Land Facebook page and were astounded with the enthusiastic reception. So many memories. Several people featured in the commercial even chimed in! Let’s look forward to making more memories this season – with a giveaway! 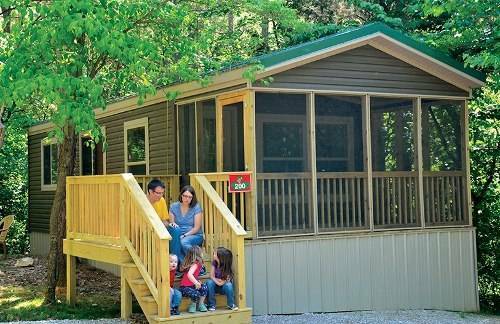 Our winner – chosen at random – will receive four one-day tickets to Holiday World & Splashin’ Safari plus two overnights in a Holiday Cottage next door at Lake Rudolph Campground & RV Resort. Use the widget, below, to enter daily. There are lots of options, so you can earn extra entries by posting here on our HoliBlog and tweeting about this sweepstakes. Earn even more entries by following us on Pinterest and visiting our Facebook pages (we’d love it if you’d leave us a Facebook Review while you’re there!). If you win, please note you must be at least 21 to phone in your two-night Holiday Cottage reservation at Lake Rudolph. The cottage will be reservable for two nights of your choice selected from these dates: May 1-23 and May 28 – June 6. Ready to enter? Just use the widget, below. And not just today – enter daily through Thursday, February 7, 2019, at 2:15pm CST, when we’ll choose one winner at random. I would love to take my daughter here for her first visit! There’s no place like Holiday World!!! Always look forward to a visit!! Would love to check the place out. Never been there, looks great on the You Tube video my family and I seen. Also, my 7yr. old loves rollercoasters. Used to live near the park and spent many happy days there with my kiddos! I would love one last trip with all my children before one goes off to college. He loves Holiday world. I used to visit as a kid when it was Santa Claus Land. I would love to take my grandsons for their first time to Holiday World! Would love to come back to holiday world this summer for another work retreat! I have been wanting to take my boys here! We visited for the first time last year. We had an amazing time and would love to return to try the water park! Love Holiday World, perfect sized park for the whole family! We are ready to make some memories there! We are excited to make memories for our family there! We are excited to make some memories there! Holiday World was the first park I took my gandaughtee to. Now we go yearly to keep building memories. My family is ready to make some memories! We would love to visit Holiday World with our daughter! We would love to make some family memories there! Would love to win the chance to a 2day weekend getaway with my family. It is so well needed. Would love to take the family to this awesome place! I would love to take my family on vacation!! We loved it there and are planning to go back this summer! I am excited to try and plan another Holdiay World vacation!